Working as a freelancer can be extremely lucrative, but deciding on how to achieve the rewards can be a challenge. You can either charge people by the hours you work or for the entirety of a completed project. This sounds straightforward, but it may be tricky because there are factors to take into consideration. With an hourly rate, you have to make sure you compensate for uncertainty. You will, either by choice or circumstance, not always be working eight hours a day, so a good formula to approximate your income should include a ‘buffer’. If as a salaried employee you were making $40,000 a year, your daily rate calculation would be $40,000/260 working days - that’s around $154/day. But because freelancing is all about flexibility, and it can have its seasonalities, you should add a 25 percent buffer to this daily rate. That would lead your daily rate to be $192.50 ($154 + $38.5). With an eight-hour workday planned, your hourly rate would be $24.0625 ($192.50/8). The problem with working solely on an hourly rate is that you can only make more money if you work more hours, and it doesn’t take into consideration the actual value added by the work you do. And that’s where a project-based pricing approach can do wonders. When you calculate project rate, you rely heavily on your experience about the level of work needed for a specific outcome. That’s why at first, sticking to an hourly rate can be best because it is easy to quantify. 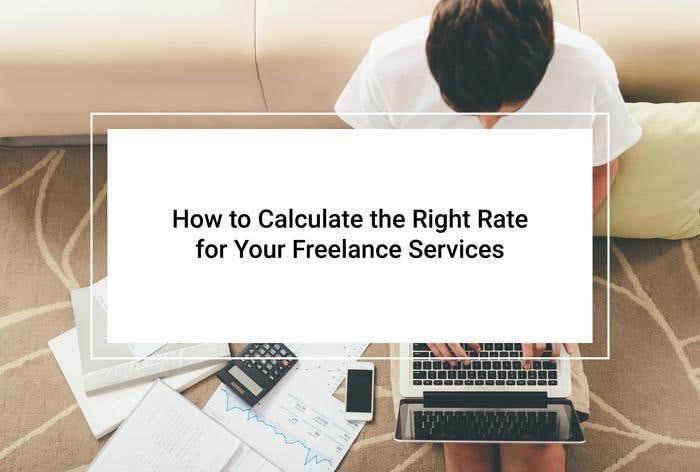 You can’t make the mistake of either miscalculating your working hours and getting underpaid or hitting your clients with an estimate that will send them right out the door. Project-based pricing can be helpful for more experienced freelancers because you can create a price that not only reflects your time but also the value you offer the client. In this form of pricing, it is essential to take the client's budget into consideration. Say their budget is $5,000, and you offered a solution worth $500, that means creating $4,500 worth of value. This is an important factor to consider when bidding. Altogether, though it is more tricky to get right on the first try, project-based pricing can move you into a bigger league financially. This is not the only way to price your freelance services. Another important aspect to look at is the market. Look at other freelancers specializing in your area and see how much they charge. Take note of their project history and experience because rates will naturally go up once you build a portfolio of valuable projects. Look at the people that not only match your skills but also your level of experience. Also, don’t be afraid to engage with the people that are already in the market. Most freelancers will be happy to chat about their experience, and maybe you can get insights on other aspects of freelancing. Once you've double-checked your freelance rate, it's time to bid on projects and help employers get things done.